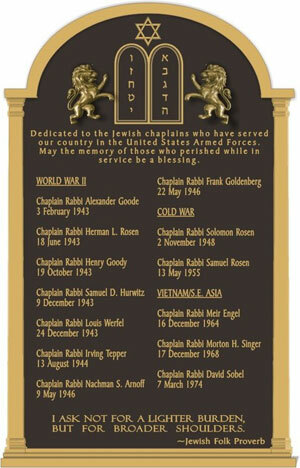 The memorial plaque dedicated to the fallen Jewish chaplains that will be erected at Arlington National Cemetery; the design and concept is by Deborah Jackson and Sol Moglen. Through persistent efforts, Sol Moglen has succeeded in having monuments erected in his native Brooklyn to the police and firefighters who died at the World Trade Center on 9/11. Now the Caldwell resident has helped honor another group of heroes at Arlington National Cemetery, where a memorial in honor of the 13 Jewish chaplains killed in wartime will be established. The U.S. Senate unanimously approved the construction of a memorial at Arlington’s Chaplains Hill on May 26, following approval by the U.S. House of Representatives on May 23; no House members voted against the resolution. Moglen cochaired the fund-raising efforts to erect a memorial along with Ken Kraetzer of White Plains, NY. “It was a special honor for me to be part of making this monument a reality,” said Moglen. “There are few times in life that an individual has the opportunity to do something so special — and I did. Dozens of national and locally based Jewish and veterans’ groups — led by the Jewish Federations of North America and the Jewish Welfare Board Jewish Chaplains Council of the JCCs Association of America — have been working for nearly three years to establish the memorial. Local agencies, including the Joint Chaplaincy Committee of MetroWest and the Community Relations Committee of United Jewish Communities of MetroWest, successfully advocated for the memorial among NJ legislators. Moglen praised Jewish War Veterans of New Jersey state commander Bernie Epworth for helping get all the state’s congressional delegates to support the resolutions. 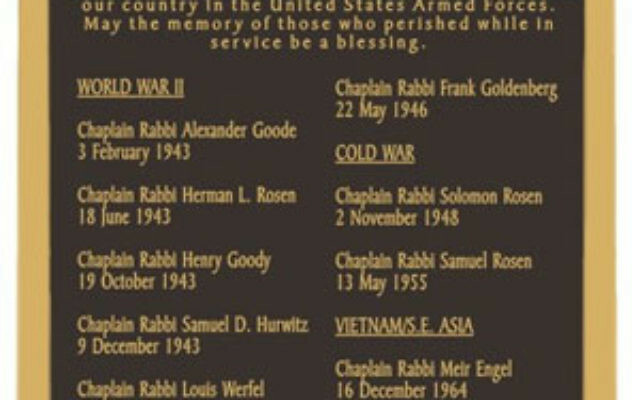 There is currently no Jewish chaplains’ memorial at Arlington. Three six-foot bronze and granite slabs at Chaplains Hill, financed by private funds, memorialize the Protestant and Catholic chaplains killed in combat. Moglen set about a fundraising effort in connection with the JWB Jewish Chaplains Council, an organization representing Reform, Conservative, and Orthodox rabbinical groups as well as rabbis in uniform. Moglen joined the army in 1957, leaving his comfortable Brooklyn neighborhood for the unfamiliar environment of Fort Bragg in Fayetteville, NC. U.S. Rep. Bill Pascrell, Jr. (D-NJ Dist. 8) said, “For many American soldiers, faith plays such an integral part in whether they are successful in battle, whether they meet their objectives, whether they survive the ordeal of war. NJJN staff writer Lori Silberman Brauner contributed to this story.